We were walking the dogs the other day when we saw a bucket truck parked in front of a house down the road. There was a worker with a long rope and a chain-saw, busy taking down some higher branches. When we got closer, we saw that there were already the remains of a great many large tree limbs piled up in front of the house. And that the bucket-truck was actually one of those covered dump-truck arrangements used by tree services, with a portable industrial wood-chipper hitched to the back of the truck. One of our neighbors was obviously having a great deal of work done on the trees in their yard – only one of which was a deciduous tree. This was too good to pass up. I ripped out the grass around my house years ago, and went to xerioscape plantings, with stone pathways and edgings of reclaimed stone from building sites. A goodly portion of my garden needed mulch, and in quantities too substantial for me to afford, even at $2.50 a bag from Lowe's ... and we were not keen on trekking down to the Bitters Road brush site for the free stuff, knowing by experience that a lot of dirt and trash often gets mixed up in it. 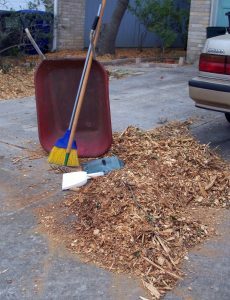 It seemed to be all solid wood going into the chipper, with very few twigs and leaves. After a little bit of jumping up and down, and semaphoring with our arms to catch the attention of the crew boss, he came over and agreed to our proposal to drop off a quantity of mulch in our driveway, when they were finished for the day. 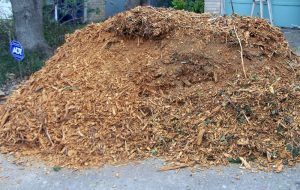 "It'll drop off about two or three cubic yards at a whack," he warned us, "And maybe even more than that – it'll be a lot of mulch!" "We need a lot!" I said, and so at around three o'clock, he came around with the bucket/dump truck, my daughter moved her car out of the driveway, and he deposited something like six cubic yards of mulch in the driveway. It made a nice pile – so much that we had to leave her car on the street until we could reduce the pile somewhat; which we began to do, Friday morning. One of our neighbors lent us her wheelbarrow; and we set to work. About three hours of shifting mulch by any means was about as much as we could handle, but we had reduced the Matterhorn of Mulch by about two thirds. 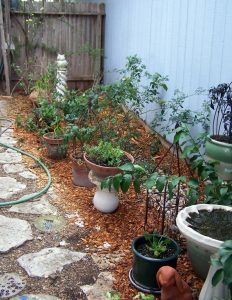 My daughter and I disagreed about the priorities: I wanted to mulch the back yard first; the part that we look at all the time, where the patio is, and where all the vegetable plantings are. My daughter insisted that no, the front was the part that everyone else saw ... and it was getting to look embarrassingly low-rent and unkempt. "We don't want to be 'those people,'" my daughter insisted – and as she had a shorter distance to transport the mulch, the largest part did finish up in the front. 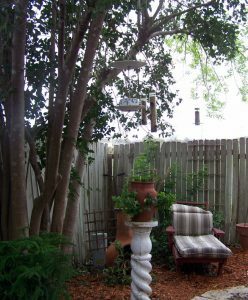 But there was so much that most of the back yard got a good share, at least the parts that I wanted to see well-covered. "We could have used another cubic yard or so," she said, eyeing the back yard when we had finished. "But I don't think my back would have stood it."